Eating bananas when dieting can help you feel full and meet your daily requirement for fruits and vegetables. The creamy texture of bananas replicates that of sinful desserts without the added fat and calories associated with these forbidden delights. With more nutrition per serving than apples, including a hefty dose of potassium, bananas are a great choice whether you are dieting or simply looking for an easy, healthy snack. The high nutritional value, mild taste and easy digestion of bananas make them a great choice for medically imposed diets such as the BRAT diet for digestive upset or the DASH diet for lowering blood pressure. Bananas are naturally high in potassium, making them a good choice for the maintenance of electrolytic balance if you are doing a lot of exercise or if you have been prescribed diuretics. What if you simply want to lose a few pounds? For most diet plans, bananas are fully compatible with guidelines and are an easily available, conveniently packaged nutritional powerhouse that will help get you through your day. See how bananas fit into your personal weight loss plan, and enjoy one of nature's finest fruits. Bananas are somewhat more calorically dense than many fruits, but also more satisfying. At just over 100 calories per medium-sized banana, the fruit can be part of a healthy breakfast or make up the entirety of an afternoon snack. Like anything else, bananas are best consumed in moderation. One hundred calories is a sensible portion, but too many bananas on a regular basis can add up to a substantial caloric impact.For a tasty, low calorie treat, add a few slices of banana to your wheat squares or bran cereal with skim milk. You will feel like you are eating banana cream pie, but with a fraction of the calories. An average banana contains 35 to 40 grams of carbohydrates. This is close to 30 percent of the value recommended for an average woman following a low carbohydrate diet, but there is more to the picture than simply the number of carbohydrates. Bananas have a reasonably low glycemic index value, which means that they have a less pronounced effect on blood sugar levels than many other foods, and they are rich in vitamins and minerals. 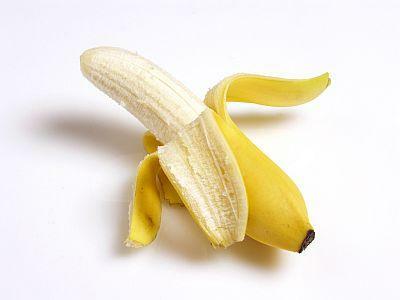 If you are going to indulge in carbohydrates, there are few foods that are a better option than a banana. Bananas typically have about one half to one gram of fat, making them the perfect food to fill the gap in a reduced fat diet. A banana with skim milk and a drizzle of honey makes a refreshing and satisfying dessert, and a banana smoothie can make a wonderful low fat breakfast on the go. Fad diets have embraced bananas as a central food since as early as the 1930s. In Fat History: Bodies and Beauty in the Modern West, author Peter N. Stearns describes early diet plans that involved eating only bananas and milk. While bananas and milk are a perfectly acceptable meal or snack, most would now agree that these two foods are not sufficient to meet all daily nutrient requirements. However, similar diets were put forth in the 1960s and 70s, each promising an easy path to weight loss. In recent years, the Japanese Banana Diet gained international attention for its extreme popularity and refreshingly straightforward premise: simply eat a banana or other fruit in the morning before eating any other food. The widespread participation in the diet made news headlines for creating a country-wide banana shortage. Markedly different than its fad diet predecessors, this diet actually seems rooted in healthy and realistic eating habits. Whether you are basing your whole diet plan on banana consumption or simply working your favorite fruit into an existing program, rest assured that eating bananas when dieting is a nutritious and sensible choice for healthy eating.